This little tank looks amazing!! I love your crab. I'll have to get some. I got one, he was really tiny, thought he molted, it wasn't, he passed so I'm hoping to get some at one point. It stinks I have to order everything, they don't carry crabs around here. Same here - I do a lot of ordering online. I don't really like it. Especially now when the weather is getting colder. And it seems like no one has more then 1 or 2 porcelain crabs at a time but shipping fees!!! Ooh very nice! I really like the simple look of just the gorgonians with the anemones. Thanks! That was the look I was going for - My other tank is a mashup of many coral varieties, so I wanted to keep this one simple. A min update to beat those Monday blues... I just ordered a snail bomb from ReefCleaners. I did not go with a cleaner package, cause I hate the dwarf ceriths. Instead, I got a mix of Florida ceriths, nassarius, and nerites to split between the two tanks. I am very, very overdue for a snail order, as each tank only has a couple of snails left from my last order over a year ago. And even then I only got 24 snails to split between my two tanks. This time I have about 40 coming my way. I really should get in the habit of refreshing my snails more often! Looks great Kimber! Sorry about the losses. Are you going to get another PSW? I'd love another PSW, as they are definitely awesome fish. The biggest problem though, is that I have never found one locally. To buy from Diver's Den (and they are available so infrequently) is pretty expensive. I wish there was another similar small, peaceful wrasse. I am considering a rainfordi goby, but again, another fish I haven't seen available local. 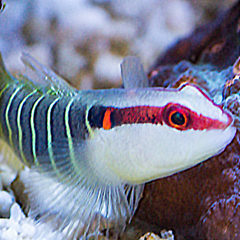 Aquapros has Yellow banded Pygmy wrasse this week. But that's sooooo far from me!! I think it's been 2 months since I put my request in locally. Maybe 3! I'll probably end up ordering from DD/LA. I want a helfrichi as well though I've since those cheaper ($60) locally before. I think they are easier to find. My first tank was a BioCube 29 that I bought used in July 2014. I had the tank set up almost 2 years before moving and setting everything up in an IM 40. I really didn't like the depth for the IM 40, so after only 4 months, I swapped the tank out for a Lagoon 25. I love the tank so much more! The tank sits on a custom stand that my boyfriend helped me make. It is a functional piece that houses my cat's litter box in the bottom and has a shelf for all the electrical. For equipment I use the stock pump, a Neo-Therm heater, Smart ATO, inTank media basket, and a Nanobox Duo. I have an RW-4 to add for extra flow at some point, but I need to get a new power supply for it. Luckily, my corals don't seem to mind the low flow. I used new sand (about 15lbs), and used old rock I had epoxied together from ReefCleaners and used in the BioCube. I have had Lenny (boy) and Squiggy (girl) the clownfish since the biocube, so they are about 2 years old at this point. Over the past few weeks, Squiggy has decided that the duncan makes a great home. It's pretty adorable. There is also a cleaner shrimp in the tank named Rickety Cricket. I'm really enjoying how shallow the tank is - especially that I can look down on my corals so easily for a top down view. I have a few corals in the tank I need to get rid of - the sand bed is much more crowded than I'd like. Once I clear out a few things, I'd like to get another fish or two for the tank, but I'm looking for something a little unique. Looking really nice!! All the coral look great together. I really like the the IM25 and what you have done with it. Everything looks so full and happy. It's really cool how Squiggy has decided that the duncan is her home. But she doesn't let Lenny in yet. That pic of her in the duncan is actually all natural light. The tank is next to a South facing window, so it gets pretty good sun if it's a nice day out. It's hard to get nice pictures though, because the room is a small room for my tanks, desk, craft cabinet and table, and a large plant rack. I might try to find some cheap white sheets or fabric to drape over things in the room so I can get nice clean looking pics from other angles. I cropped that duncan pic cause my bright green plant rack in the background is very distracting. Thanks! I plan to fill with mostly LPS, leathers, and a handful of SPS frags. All of my extra pieces are going to their new home today, so hopefully my sand bed will look cleaner. 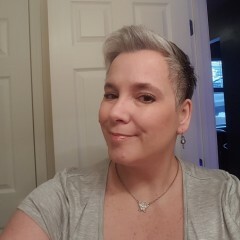 I just really like a more open look! 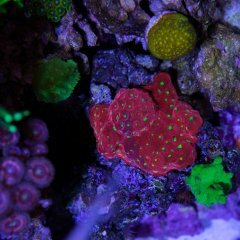 I'm really glad to get rid of so many Monti frags, I think they are sucking up all my nutrients. I used to be able to get away with a water change every other week, but the last few times I tried to stretch have it out, the SPS have looked unhappy. My water change night is usually Wednesday, but I need to prepare a few things for Thanksgiving, so I'll be getting a quick change done Thursday early morning. I'm surprised your boy friend was on board with that weezer poster. He really doesn't care what I do to "my room" as long as I don't trash it. He's even come to the rescue a few times when I've forgotten to fill my ATO container. I asked him yesterday if he would be mad if I won a third tank in a contest. His response, "You're the one who has to take care of it, so what do I care?" I'm gonna keepthis one! O no kimber, that is terrible but at least you caught it fairly quick and can now take action! Those moments when it first dawns on you what has happened can be sickening. I remember finding after dusting my 90 gallon that it had very slowly walked on its stand so that the back corner was no longer squarely on the stand! Now the AGA stands have the tank sit down in some instead of just on top so I am thinking its been a problem for others too. Anyway that feeling of panic was terrible.